The Russet potato is the most-produced variety of potato in the United States, according to ronningers.com. Even so, russet potatoes cannot be grown everywhere. Russets are a late-maturing variety of potato and require a long time underground. 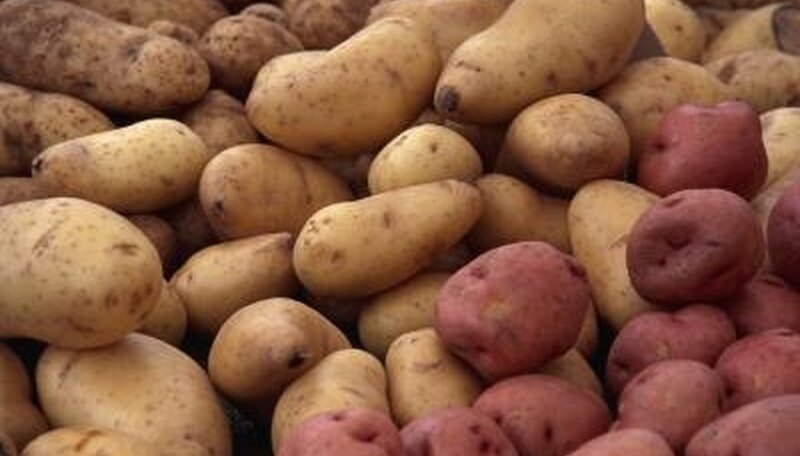 As such, hot climates such as the southernmost regions of the United States are not suitable for growing russet potatoes, as warm climates induce rot and bacteria in cold-weather tubers. These potatoes, therefore, should only be grown in cold northern climates; they do not grow well in Florida and Southern Texas. You can plant russet potatoes as early as March. Select your seed pieces. Potatoes are grown from actual seed pieces of already-grown potatoes. You can select seed pieces from among your previously grown crop, potatoes from the grocery store, or from a gardening store. Small whole potatoes can also be used as single-seed pieces. Cut a large russet potato into four to six pieces, making sure that each piece has at least one eye (looks like a button). Each seed piece should weigh about 2 oz. Time your growing season. Russet potatoes are late-season maturing, meaning they take, on average, almost twice the amount of time to mature; between 100 and 130 days. As such, they require a long time under the ground, which makes them more susceptible to rot. Prepare the soil. Potatoes are relatively hearty and can grow in most types of soil; however, the soil must be drained and well-fertilized. If the soil is dense clay, plow it thoroughly with organic matter. Fertilize the garden bed with a chemical fertilizer low in nitrogen and high in phosphorus, such as a 6-24-24, or 8-24-24, before planting the seed potatoes. Till rows for planting that are about 24 inches apart from each other. Plant each seed potato about 1 to 3 inches deep in the soil spaced about 12 inches apart. Water the row beds thoroughly. Once the plant emerges from the soil, surround it with organic mulch to keep out weeds and to maintain a low soil temperature. Add soil around each potato plant as it emerges. When potatoes grow, the tuber begins to peek out of the soil. Premature exposure to sun ruins potatoes causing them to green and burn. To counteract the growing height, mound soil by using a hoe to build up a ridge around the base of the potato plant. Add more soil to the mound every week to keep the potato hidden. Take caution not to stab the potatoes while hoeing, as cuts destroy young potatoes. An alternative to mounding the potatoes is to cover the soil around each plant with black plastic. Water regularly. Regular watering ensures sufficient growth and cools down the soil. Russet potatoes must have cool soil to grow in or they will begin to rot.